Dramatically reduce intake restrictions and get an impressive improvement in power throughout the entire RPM range with the Mazda6 SkyActiv Short Ram Intake System. MAF housings engineered to exact tolerances and manufactured using the latest in computer-aided techniques. Machined from 6061-T6 aluminum. **How to find your build date of your 2014-2017 Mazda 6. Open the drivers door and locate the vehicle identification sticker. It will look like the picture below. There will be a location which says date shown with the red arrow. That is what you need to find your build date. 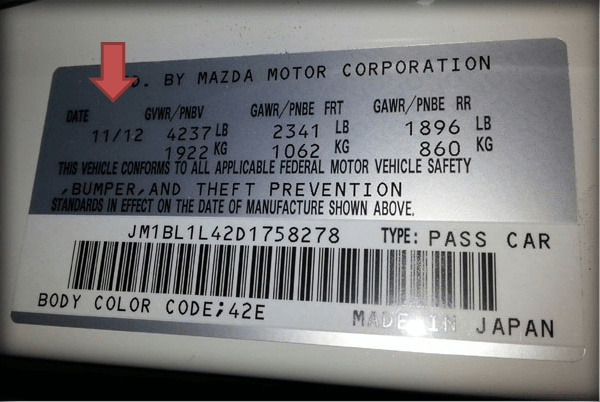 As you can see on the example below the Mazda was built in November 2012. It will take you three hours to install the CorkSport Mazda6 SkyActiv SRI with our easy-to-use instructions. Super easy to install, took maybe 30 minutes including finding my tools. Sounds great as well! very easy to install and you do NOT need any knowledge at all. the full colored instructions are extremely simple to follow. I love the swooshing sound of air sucking when you tap the gas pedal!!! I really like the sound and feel of the car after this installation. It has a nice sounding, agressive growl between 1500-3500 rpm that is not overwhelming or annoying. The breathing and power between 3500-6000 on the highway is great! 1/2 hr to install, and worth the price. feel like my car is breathing better. good adding to my car. like it even i have not tried others. Zoom Zoom. Installed this on my 2015 Mazda6 i Sport 2.5L in ~15min. Noticed she was a bit peppier and the exhaust tones are noticeably better, but not over done. Well worth the price! An absolutely flawless product that is incredibly simple to install! Intake sounds great when you get on it & full wail is amazing! Throttle response is now immediate compared to the stock setup. Short Ram Air Intake: Very quiet. When stepping on the gas, I hear a nice growl sound that is not annoying, but good to the ears. As for power gain, I can definitely feel the additional torque; it's not a crazy improvement, but definitely worth the money. If you need to start somewhere with a mod to increase performance, check this little baby out. i've had this on for a couple of days, and i LOVE it! due to my own mistake, i had ordered the wrong one. no issues now though and customer support/service was amazing! Easy install, great efficiency increase for my mpg! Just installed this on my 2015 Mazda6 Touring and in in love with it. I have only driven it for a day or two but it's awesome. My car is hitting 2nd gear very hard since i put this on? i put back the stock air box just to be sure. whats up? it pre shifts 2nd at low RPM and need to know if i am missing something? What is the ACTUAL estimated gains in mpg and horsepower? When will this product be available for the post-March build date 6? 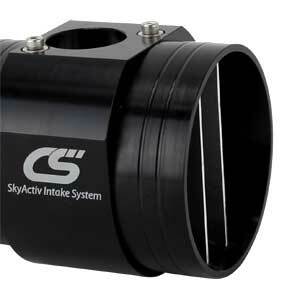 Does this work with the 2013 Mazda 6 manual 2.2L diesal turbo? When installing this I have read that you have to get your computer flashed. Is this true? You can run it on the stock tune. To get the most power from the intake a tune is a good idea. Does this effect the Mazda factory warranty? 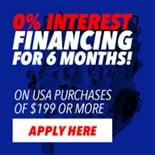 It does not affect the warranty, you can confirm with your Mazda Dealer. However, some dealerships will put it on before they even sell it. But also will boil down to your area. I need to replace the filter, do you guys sell replacements and if not what are the dimensions of the filter itself? 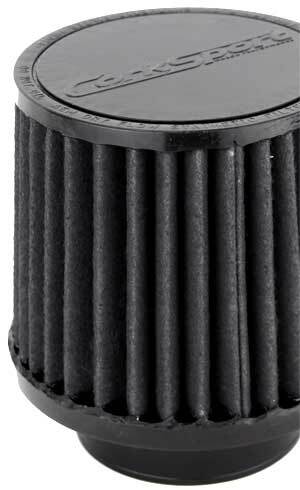 Hello, The replacement filters are currently not listed on the website for the 2.5 L engines. Please give us a call and we can help you out. I just got rid of my 2010 Mazdaspeed3. I still have the mass air flow housing from my corksport intake. Is this the same mass air flow housing? If so can I order the silicone elbow alone? No. You need an entire new intake for that car. does it fit the two types 2.0l and 2.5l engine? This is specifically for the 2.5L. Will you guys eventually make a heatshield for this intake ? I do not have any information in regards to this, but if we do decide to release something like that we will have it posted all over our page. Any updates for a 3rd gen Mazda 6 CAI? No update yet. Just keep an eye on us. someone is selling this short ram on craigslist... does it fit a 2013+ cx5? If you have a 2.5 model Mazda 6 and it meets the production year criteria it will. Are you working on a CARB SRI or CAI? We are not. The cost to do CARB is around 12k. I saw an option to put on your built day when you select the intake but now the option isn't there anymore. Does it matter when you put in the order? As long as your Mazda 6 is newer than March 1st 2013 for the build date they are all the same. The option to select should be at the top of the page. Is the SRI CARB legal? This is not CARB legal.